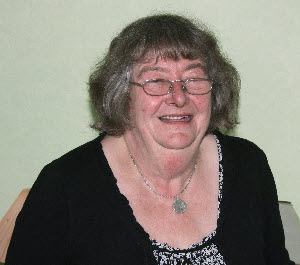 Judith Mason was born in Settle in 1945, but her parents moved to Long Preston when she was a child. She attended school at Long Preston and then at Ingleton. Judith worked for 20 years as a music teacher in Skipton. Part A: Born in Settle, Judith's parents moved to Bankside in Long Preston in 1947. Her Father worked as joiner for Beecrofts the undertakers, then he worked on the railway. Memories of school days in Long Preston when children made their own amusements; played rounders on village green, tennis cricket & football. Long Preston self sufficient in shops. Went to secondary school at Ingleton, where she got a County Major Music Scholarship to Huddersfield. Part B: Playing in the Station Yard and on the Iron Bridge and tickling fish. About the Cattle Mart and goods yard, small-holdings and black market goods. Singing in chapel & Sunday School trips & harvest festivals. Part C: More memories of Secondary schools and travel by bus and train. After college first job was working for the travelling school dentist. Then taught music for twenty years at the girls school in Skipton. How she met husband and got married and had children and memories of Christmas. Part D: Allotments in the village and how most people lived & worked in village. Was very active in the Drama Group.